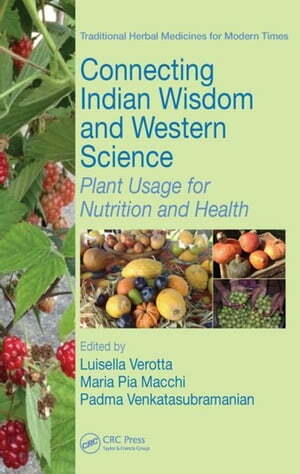 Collins Booksellers - Connecting Indian Wisdom and Western Science: Plant Usage for Nutrition and Health by Verotta, Luisella, 9781482299762. Buy this book online. A truly integrated collection of research, Connecting Indian Wisdom and Western Science: Plant Usage for Nutrition and Health compares Ayurvedic and Western conceptions of wellness, healthy lifestyle, and diet. Examining the phyto-pharmacological, phytochemical, clinical, ethnobotanical, sociocultural, and biomedical approaches to plant- and herb-based healthy diets and wellness, it includes approximately 40 selected monographs on fruits, vegetables, spices, nuts, and seeds, complete with Ayurvedic and traditional uses as nutritional ingredients. The book focuses on how plants can be employed as both aliments and adjuvants, able to improve health and the quality of life. It does so by comparing the Indian Ayurvedic tradition with the Mediterranean diet. Chapters written largely by Indian authors trace the early history of Ayurveda and the basic principles and dietetics of the Ayurveda, Siddha, and Unani systems of medicine. Chapters written by western scientists and nutritionists discuss the global focus on nutrients, nutraceuticals, and, importantly, the Mediterranean diet. Building on this foundation, the book opens what will, no doubt, be a long and continuing journey of mutual exchange and dialogue. The authors create an integrative perspective for understanding India's health traditions through the lens of modern science. They then look at how India's millennia of experience can enrich the West's notions of optimal nutrition, prevention, and personalized healthcare. A core of this exchange is a frontier of exploration into deep insights of human biology, individual differences and seasonal influences on metabolism, and a conceptual approach to nutrition that you can apply across foods and cultures.